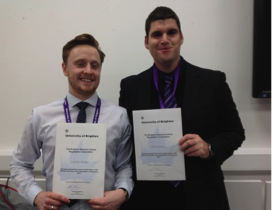 December 2014 – The University of Brighton hosted two competition finals for its law students in association with DMH Stallard and McMillan Williams solicitors and Gerard Maye Legal Services. The University of Brighton Negotiation Competition 2014-2015 saw students from Law with Business, Law with Criminology and the Postgraduate Diploma in Law courses compete in a tightly contested final, judged by Faye Didcote (Solicitor, Dispute Resolution, DMH Stallard), Michael Hartley (Personal Injury and Clinical Negligence Solicitor, McMillan Williams Solicitors) and Dawn Fazackerley (Graduate Recruitment Manager at MW). 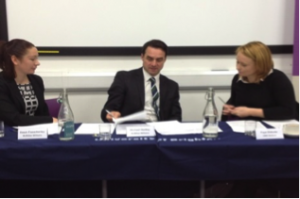 The judges were delighted to announce the winners as Jordan Powell, Lucy H, Declan McArdle and Dewi Jones, who will go forward to represent the University of Brighton at the Centre for Effective Dispute Resolution (CEDR) Negotiation Competition in 2015. The lead up to the competition had seen a host of students taking part in workshops and practical sessions, led by Law Lecturer Juliet Turner, to hone their negotiation skills. Using a range of scenarios, students considered their client’s objectives and interests; what the competing team was likely to want; and their own strengths and weaknesses, to put together a negotiation strategy. 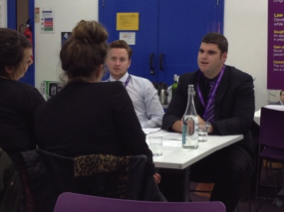 Faye came in to support the workshops and gave students an invaluable insight into negotiation in practice, whilst last year’s University of Brighton CEDR Negotiation Competition entrants (Richard Meakins and Tallia Burgess) offered their hints for negotiating success. The judges were delighted with the standard of the negotiating pairs. Faye commented: “It was a pleasure to be involved in the negotiation competition this year on behalf of DMH Stallard LLP. The finalists all did fantastically well and demonstrated some skilled negotiation. I was particularly impressed with some of the creative solutions proposed by the teams, which enabled them to work together towards a common goal. Very well done to them all!“. 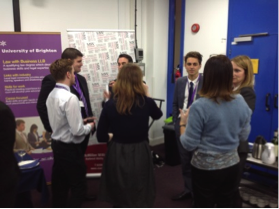 Michael was similarly impressed “It was an absolute pleasure to be the McMillan Williams Solicitors judge at the University of Brighton Negotiation Competition. It was great to see the spark and enthusiasm of the students”. Winning team student Lucy said “I am so glad that I got involved in the negotiation competition. The practice workshops covered the principles behind negotiation, however the emphasis was firmly placed on putting these into practice using different negotiation scenarios. We received lots of feedback during the practice sessions, which helped us to improve on and widen our own methods and skills as the weeks went on. It has been a really worthwhile experience and I feel I have gained invaluable insight into the increasingly important commercial field of Alternative Dispute Resolution from being involved”. Jordan agreed, commenting that the competition was a good opportunity to think quickly, work in teams and communicate well to achieve success. Dewi said “The skills that I have learnt during this year’s competition I am sure will be invaluable in the future – in particular the ability to think on my feet and understand how important preparation is. Our team was very well prepared for all of our negotiations and I believe this is one of the main reasons we were successful. We had some really well thought-out creative ideas and we also had break downs of any facts or figures we needed for our negotiations”. Declan was similarly pleased to have taken part, noting that it was a great chance to turn theory into reality. All four winning students have gained the much coveted work experience at DMH Stallard and McMillan Williams Solicitors. Dewi commented “I have learnt new skills, met new people from other years at my university and furthermore been offered some work experience as my team was a successful finalist, which as all law students know is invaluable”. 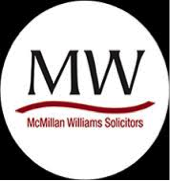 Lucy said “It is great law firms such as DMH Stallard and McMillan Williams are keen to support students. I’m really excited about the work experience I gained as a result of taking part, which will be a huge benefit when I start applying for jobs after the course”.